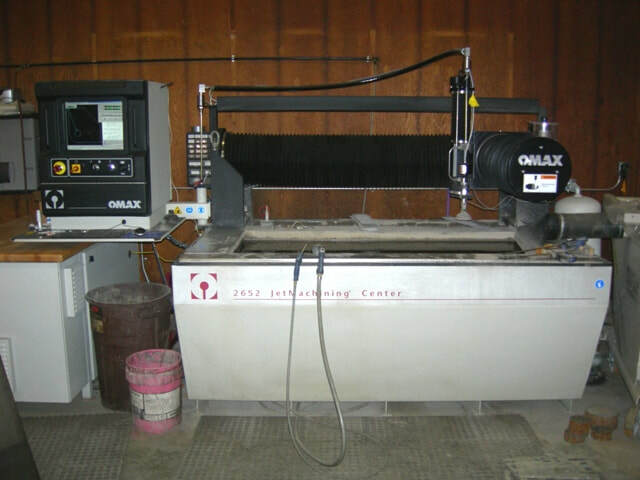 Riverside operates an Omax 2652 Waterjet machine. Using high pressure water (approximately 50,000 psi) and sometimes an abrasive material, water jet machines are capable of cutting through a vast array of materials and thicknesses on an accurate basis. Riverside can start with your drawing or model and import it to cut your part with minimal modifications, depending on the application and geometry of the part. Different finishes are available and are chosen as a trade-off between the part requirements and cut-time. Material: Water can cut just about anything including metals (from soft materials like aluminum or brass to hardened tool steel), plastics, stone, glass, non-conductive materials, and more. Depending on the part and the application, materials as thick as 6" can be cut. Virtually no heat built up or melting point issues. Refraction is not a concern as it would be with laser cutting. CNC Operation: Parts can be cut directly from your drawing or model. For this particular process, a 2D Flat DXF drawing is easiest to work with. Part nesting: Have multiple parts that you need or a large quantity of the same part? We can nest them in virtually any configuration. Contact us today to see if your application is a good candidate to be cut with water!